Bear with me as I tell you the story of a place far away, but one whose story will sound familiar. Maybe all too familiar. It’s Toowoomba, a city of 120,000 in Australia’s interior. The funniest thing about Toowoomba is its name (it’s an Aboriginal word that means, more or less, swamp). Toowoomba isn’t actually in a swamp; it sits atop a range of low mountains and is known as a pretty place where people take pride in their gardens, their local university and their schools. But as Charles Fishman describes in his new book, “The Big Thirst,” Toowoomba has a terrible problem, which it shares with the rest of Australia. It is running out of water. Australia is 10 years into a drought that has become such a part of Australian life that it is called simply “the Big Dry.” Toowoomba’s particular problem is that, because of its location, it suffers a little more than other places, as water runs quickly off its slopes. By 2005, with the drought in its fifth year, Toowoomba had done the usual things, forbidding outdoor watering, hiring officers to look for scofflaws, and holding community religious services for residents to pray for rain. No luck. The city’s reservoirs were down to 34 percent of capacity, and political leaders were desperately looking for solutions, any solutions. You can imagine, then, the excitement that Mayor Dianne Thorley felt when, in May 2005, she addressed a local women’s club with news of a breakthrough: For six months, she told the members, she and city water engineers had been studying water systems around the world and had a plan to recycle waste water as crystal-clear drinking water – extending the city reservoirs’ capacity and, possibly, saving the city. Even so, it took a while for opposition to build. In the meantime, the city council approved the plan unanimously. The governor of Queensland, where Toowoomba is located, endorsed it. So did the member of parliament from the city. And the national government offered to pay two-thirds of the cost of the advanced treatment facility needed for recycling water. By then, though, a citizens’ rebellion had begun in earnest. A former mayor weighed in, calling it the work of “sewer sippers.” If it came to pass, he thundered, Toowoomba would be known as “Poowoomba.” A group called CADS, Citizens Against Drinking Sewage, organized. And the federal government, seeing the furor, changed its mind, saying it would participate only if the voters of Toowoomba agreed to it in a referendum. Well. You won’t be surprised that on July 29, 2006, the voters of Toowoomba said no to the water recycling idea by a thumping 62 percent majority. The only surprise is that it wasn’t unanimous. As discouraging as Toowoomba’s experience was, it raises a good question: How can you deal with fear and demagoguery? This isn’t something that happens only in the Australian Outback or with proposals for recycling water. It happens every day in America, where complicated issues are put before voters promising an important benefit, but only if voters will pay a little more in taxes, change a familiar habit (such as commuting to work by train rather than car), or overcome their squeamishness. These ideas are sitting ducks for opponents whose only chore to come up with a slogan clever enough to play on citizens’ fears and doubts. When they do, the game is over. What Mayor Di didn’t appreciate that day in May 2005 was that she was introducing a whole new way of thinking about water. She wasn’t being “sneaky” – to use Morley’s word – in the least. But Mayor Di didn’t seem to grasp that people might have different attitudes about water, and about what kind of water is wholesome. But realistically, had she been more empathetic, what could Mayor Thorley have done? She could have taken six months to let the public work through the conversion process that she had made in days. When she spoke to the women’s club, her announcement should have been that she was forming a large task force (made up of friends, critics and respected leaders) to look at solutions to the water crisis and involve the community in learning about the options. Recycling water could have been one of the options, but only one. Knowing how squeamish this option would make people, she could have suggested video conferences between task force members and people in Orange County and Fairfax County. She could have suggested a partial solution: Build an advanced treatment facility but use the water only for non-drinking uses, such as for industrial processes or in city fountains. Then she could have put goldfish in the fountains and invited everyone to watch the fish. (One resident of Toowoomba actually suggested this idea. It would have been persuasive.) After people saw the fish thrive (with no harm to the males), she could have suggested finishing the project. 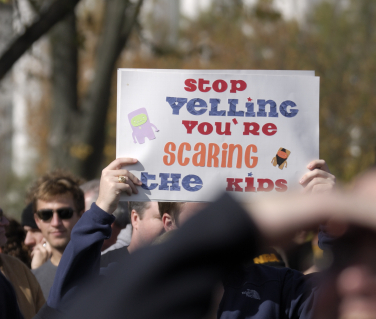 The secret to defeating fear is a lengthy, open but certain decision-making process, one that allows not just those involved in the decision but everyone an opportunity to learn about controversial ideas without being hurried, to explore alternatives, and discuss and reconcile their feelings. In the end, of course, you have to make a decision. But in most cases, you don’t have to do it at the snap of your fingers. And you don’t persuade others by telling them just to get over it. So what happened to Toowoomba after the referendum? An advanced treatment plant was built in Toowoomba but only to supply water to a coal mine operator. (The facility doesn’t bring the water up to drinking standards.) Eventually, Toowoomba signed an agreement with another water system to pump drinking water up the mountain. The pipeline and pumping stations will cost about twice what the recycled water system would have and have much higher operating costs that will grow as the price of energy increases. Fear, it turns out, has a price. Toowoomba’s water users will be paying for their fears for many years to come. And now, the final irony: The water system that’s supplying the water to Toowoomba is building . . . you guessed it, recycled water facilities. So while the citizens of Toowoomba won’t be drinking water that has passed through their own toilets, they’ll be drinking the water from others’. 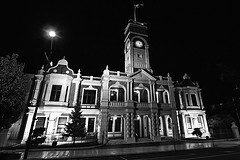 Photo of Toowoomba City Hall by Tim Swinson licensed under Creative Commons.